(Washington, DC) - - The Corporation for Public Broadcasting today announced the launch of the PBCore 2.0 Development Project. The PBCore 2.0 Development Project will also work to enhance the PBCore standard to ensure that it will be able to satisfy the demands of multiplatform digital content as well as an evolving World Wide Web. Since PBCore's development in 2005, it has become not only one of the most widely-used metadata standards in the world, but also the basis of other metadata standards. At the same time, in the last five years, the number of digital media applications that would benefit from PBCore has grown significantly. An updated PBCore will benefit not only public broadcasters, but all users of metadata standards based on PBCore. As PBCore finds itself used in a multitude of settings, databases, media information systems, and organizations, it is appropriate to "Re-Reconnoiter" with the Public Broadcasting Metadata Dictionary, particularly with regard to the American Archive Pilot Project (AAPP). At the September 2009 conference, hosted by Oregon Public Broadcasting in Portland, Oregon, PBCore was re-visited, highlighting its origins, its purpose, how it can be applied, and what could be considered better practices in the use and abuse of metadata descriptions. Certainly metadata plays a pivotal role. In a Re-Reconnoiter of PBCore, Paul Burrows (Media Solutions, University of Utah) recalled the genesis of the metadata dictionary and joins with the participants in exploring how its well-researched and well-defined metadata elements can be applied in describing media items and in sharing those descriptions between different information systems. WNET/Thirteen hereby releases the software of its PBCore Repository Project under the GPLv3 license (http://www.gnu.org/licenses/gpl-3.0.txt). The PBCore Record Repository is an online database tool built on Ruby on Rails, Sphinx search, and MYSQL that was created at WNET/Thirteen to facilitate the import, export, search, creation and modification of PBCore records according to the PBCore 1.2.1 standard (http://www.pbcore.org/PBCore/PBCoreXMLSchema.html). PBCore v1.2 is on the Horizon!!! A portion of the original PBCore v1.1 metadata dictionary is changing into what will be known as PBCore v1.2. The justification for changes to the PBCore schema is to better accommodate the possibility that a media asset may have multiple instantiations, all the same except for technical attributes. Thus, metadata elements that describe a media asset as a whole still exist in v1.2; however, the different attributes associated with multiple instantiations are now "containerized" under a new container called the pbcoreEssenceTrack. That's quite a mouthful. To preview the differences between v1.1 and v1.2, visit our web page on the PBCore XML Schema (XSD). Comparative diagrams and further narrative discussion is provided there in order to highlight what will be the next edition of PBCore. An updated version of the XSD is immediately available for download from the same web page. However, the documentation and User Guide for PBCore has not yet been updated throughout the overall PBCore website. Stay tuned for that adjustment. Preview PBCore v1.2 At-a-Glance. Download v1.2 of the PBCore XSD. Jack Brighton is the Assistant Director of Broadcasting and Director of Internet Development at WILL Public Media, University of Illinois at Urbana-Champaign. He has spearheaded the effort to provide you with a place to share PBCore experiences, ask questions, and provide observations, all in a threaded discussion format. As well, announcements and links to related metadata activities and presentations are provided. The PBCore Resources Website (http://www.pbcoreresources.org) can be considered a companion to the primary PBCore site (http://www.pbcore.org). Please visit the new user resources site, create a log-in, and begin sharing and learning about all things PBCore. IMA Conference Presentation on PBCore (February 2008): "The Internet as Public Media Library"
As a database file, the Tool required the user to purchase and install the actual FileMaker application in order to launch and run the Tool. We call this iteration of the Tool the Standard Version. The PBCore project has just made availabe the Tool's Runtime Versions. The Runtime Versions do not require the FileMaker application. They are stand-alone, self-launching files and are available in two editions, one for the Macintosh and one for the Windows operating systems. With the release of the PBCore Cataloging Tool, a QuickStart Guide was posted to the PBCore website. This Guide has been greatly expanded and in essence has become your User Guide to the PBCore Cataloging Tool. The updated guide provides step-by-step instructions on using the Cataloging Tool, how to enter metadata, how to create User Accounts, making reports and print-outs, how to modify picklists, and the steps to both import and export XML metadata that complies with the PBCore XSD (XML Schema Definition). Don't just start poking around the buttons and layouts of the Cataloging Tool. Reference the QuickStart Guide for easy reading and rapid instructions. A Table of Contents is included in the Guide. This QuickStart Guide provides instructions for both the Standard version of the PBCore Cataloging Tool (requires FileMaker Pro) as well as the Runtime versions (stand-alone, no application software required). (FileMaker for Mac & Windows) Ready for Download!! Need to catalog media items using the PBCore Metadata Dictionary? From our PBCore User Guide (http://www.pbcore.org/PBCore/PBCore_Tools.html) you may now download the FileMaker Cataloging Tool along with two read me files (for end-users, and for admins/developers who want to customize the tool). An audio/video overview of the Cataloging Tool is available in our fourth training module, PBCore 104 at http://www.pbcore.org/PBCore/PBCore_TrainingMaterials.html#trainingfiles. From within the Cataloging Tool, each metadata field is accompanied by a direct hyperlink to its definition and guidelines for usage in the PBCore User Guide. -- to our beta testers: Geoff Freed/WGBH; Paul Burrows/KUED Media Solutions/University of Utah; Glenn Clatworthy and Julie Fenderson/PBS; Dave Rice/Democracy Now! ; Regina Kammer and Michelle Futornick/Stanford University News Service; Cecilia Merkel/WPSU; Tom Cummings/WBGU; Kat Sripathy and Mary Ann Thyken/ITVS; and others who volunteered. We believe we have addressed and implemented most -- about 90% -- of the feedback in this released version of the tool. Included in our report to the Corporation for Public Braodcasting is a list of suggested enhancements that will better serve known future needs of PBCore and its users. The PBCore Users Group listserv (sign-up available at PBCore.org) is a resource to support the PBCore community of practice -- please share your questions, experiences and innovations. How do the PBCore elements map to other metadata dictionaries and schemas? In our PBCore User Guide (http://www.pbcore.org/PBCore/PBCore_Mappings.html) we provide 15 entries related to the mapping of PBCore elements to other metadata systems. Some of these documents we have authored from scratch. Others are documents generously provided by other librarians, information science researchers, public broadcasting entities, and long-time participants in the PBCore Metadata Dictionary Project. In some cases, actual mappings are still being vetted and refined, but will be posted as soon as they are "green lighted." You will notice that some mappings are not strictly about PBCore, such as the Dublin Core crosswalk to MPEG-7 and MARC 21. We have included these seminal works because they act as bridging documents for future PBCore comparisons and mappings. PBCore is specifically mapped in detail for both Dublin Core and IEEE LOM Learning Object Metadata (where you will find over a dozen elements related to the integration and utilization of media items in educational settings). A background section provides context to the intricacies of harmonizing different metadata dictionaries with each other, explaining how and why element pairings are not always perfect. To further discuss PBCore Element Mappings & Crosswalks, we highly recommend joining the PBCore User Group Community (http://www.pbcore.org/contacts/index.html#PBCoreUserGroupListserv) and sharing your questions and experiences there in the threaded discussions and listserv. What do Complete Metadata Records look like with PBCore? In our PBCore User Guide, the Full Documentation and Cheat Sheet Documentation for the PBCore metadata elements provide numerous examples of data entries. These examples are viewed on an element-by-element basis. We have now posted samples as complete metadata descriptions on a record-by-record basis where all the PBCore elements are populated with descriptive data for a given media item or object (http://www.pbcore.org/PBCore/PBCore_SampleRecords.html). Our sample records catalog different media types and variations on "repeating elements and containers." The layout of our sample metadata records follows the structure of PBCore in an easy to read format, showing each element within its container, organized by Content Class (Intellectual Content, Intellectual Property, Instantiation, and Extensions). If there is a question about the definition and best practice for using an element, each is hyperlinked to its original documentation in the PBCore User Guide. Containers and Sub-Containers can be repeated if there are multiple instances of metadata descriptions. For example, if there are multiple renditions or media formats for a single asset, then the container pbcoreInstantiation (with its metadata elements) is repeated for each rendition; on the other hand, the Intellectual Content for the entire asset is only entered once within a single metadata record for the entire asset and all of its multiple renditions. Likewise, if an asset has descriptions for both Temporal Coverage and Spatial Coverage, then the container pbcoreCoverage is repeated in order to enter the keywords for each type of coverage. We have even provided an example of a full-length program and the discrete segments it contains. Every Sample Metadata Record provides a link to a complete XML version of the sample descriptions, in accordance with the PBCore XSD (XML Schema Definition). To further discuss PBCore Metadata Records, we recommend joining the PBCore User Group Community (http://www.pbcore.org/contacts/index.html#PBCoreUserGroupListserv) and sharing your questions and experiences there in the threaded discussions and listserv. While the examples included with the element-by-element definitions offer "samples at a glance," what is missing are actual Use Cases outlining how various stations and organizations implement PBCore elements in their own workflows, program descriptions, production activities, promotions, and sharing. Reviewing actual implementations of the PBCore is valuable because it shows how our metadata building blocks are used in real-world applications. So far, our previous Training Sessions 101-103 dealt with defining metadata, examining the PBCore metadata elements, and reviewing the PBCore XML Schema (XSD). Now Session 104: The PBCore Cataloging Tool is now available for On-Demand viewing. Discussion of the PBCore FileMaker Pro cataloging tool (releasing September 28, 2007 for download from http://www.pbcore.org/PBCore/PBCore_Tools.html). The tool facilitates the markup of descriptions for media objects and has XML data import and export capabilities for sharing and interoperability, based on the PBCore XML Schema Definition (XSD). The on-demand versions of the trainings are posted as PowerPoint, Acrobat PDF, QuickTime Movie, Audio MP3, and iTunes/iPod Compatible Video. To download, visit our web page http://www.pbcore.org/PBCore/PBCore_TrainingMaterials.html. So far, our previous Training Sessions #1 and #2 dealt with defining metadata and examining the PBCore metadata elements. Training #3 is now availabe On-Demand in a variety of digital file formats. New training opportunities for PBCore, both online and on-demand, were announced. As well, a call-to-action was made to the attendees to participate in PBCore's Community of Practice by joining the Listserv. PBCore v1.1 XSD is Published! The PBCore v1.1 XML Schema Definition (XSD) is published! For a complete discussion on what this means for the advancement of PBCore and facilitating our Community of Practice, see http://www.pbcore.org/PBCore/PBCoreXMLSchema.html. Since the initial publication (April 2005) of the Public Broadcasting Metadata Dictionary (PBCore), many stations, organizations and information systems have begun to use its 53 elements to describe the intellectual content, property rights, and instantiations/formats of their media items. At the same time, the PBCore project has been perfecting its XML Schema Definition (XSD) (for a discussion of XSD see the PBCore XML Schema web page http://www.pbcore.org/PBCore/PBCoreXMLSchema.html). This XSD is the main framework upon which all the PBCore elements, their relationships, vocabulary picklists, and data types are organized and defined. The purpose of building an accurate and meticulous XSD is to ensure that when PBCore compliant metadata descriptions are shared between data systems, the contributing system and the receiving system are both able to "machine read" and faultlessly interpret and display the descriptions. During the exacting process of creating the PBCore XSD, we determined that some enhancements to the underlying structure of PBCore were necessary. For the most part, these enhancements are related to binding together related metadata elements (such as Title and TitleType) into new containers that are designated as "parent" elements. In a hierarchical arrangement, each parent element will collect and house associated "child" or sub-elements. Basically, what was a "flat" arrangement of the 53 PBCore elements is becoming a more structured "hierarchical" arrangement (for a discussion of hierarchical arrangements, see the Hierarchical vs Flat Elements Relationships web page http://www.pbcore.org/PBCore/PBCoreHierarchies.html). The underlying meaning and attributes of the PBCore elements are not changing. However, their inter-dependencies and structural arrangements are. We realize these alterations may impact current adopters of the PBCore Metadata Dictionary, and we invite your comments and concerns. As well, the PBCore website has published a complete description of the changes between version 1.0 and 1.1 (see PBCore Elements Viewed by Changes, http://www.pbcore.org/PBCore/PBCore_by_ChangeOrder11.html). We feel the improvements to PBCore will greatly enhance its usability by Public Broadcasting communities and certainly improve the precision involved in sharing metadata between various information systems. The first two training sessions for PBCore are available for on-demand download. Go to http://www.pbcore.org/PBCore/PBCore_TrainingMaterials.html#trainingfiles . Sessions 3 and 4 will be scheduled soon. Watch for announcements on the PBCore website (http://www.pbcore.org) as well as on the PBCore Listserv. An introduction to the nature of metadata and the PBCore. A more detailed look at the structure of PBCore, what each of the elements are, and how to use them to describe media objects of all kinds. A general discussion of what an XML Schema is, and a look at how the PBCore XML Schema can be used to implement the PBCore metadata dictionary within information and cataloging systems. Also explains how important the XML Schema is for sharing metadata and interoperability. A detailed discussion of tools that use PBCore. The tools facilitate the markup of descriptions for media objects and have data export capabilities for sharing and interoperability. For a complete review of available training materials for PBCore, visit our web page http://www.pbcore.org/PBCore/PBCore_TrainingMaterials.html. We have been undertaking some behind-the-scenes technical updates for the PBCore website, none of which impact how you currently access http://www.pbcore.org or http://pbcore.org (but which should improve performance). We are excited to announce that Version 1.1 of PBCore is released. Since the initial publication (April 2005) of the Public Broadcasting Metadata Dictionary--PBCore v1.0, many stations, organizations and information systems have used its 48 elements to describe the intellectual content, property rights, and instantiations/formats of their media items and intellectual properties. During this last year, the PBCore project was finalizing its XML Schema Definition (XSD) (for a discussion of XSD see The PBCore XML Schema web page). This XSD is the main framework upon which all the PBCore elements, their relationships, vocabulary picklists, and data types are organized and defined. The purpose of building an accurate and meticulous XSD is to ensure that when PBCore compliant metadata descriptions are shared between data systems, the contributing system and the receiving system are both able to "machine read" and faultlessly interpret and display the descriptions. In the process of creating the PBCore XSD, we determined that enhancements to the underlying structure of PBCore were necessary, resulting in PBCore v1.1. For the most part, these enhancements are related to binding together related metadata elements (such as Title and TitleType) into new "Element Containers." In a hierarchical arrangement, each Element Container collects and houses associated "child" Elements that are thematically related. Basically, what was a "flat" arrangement of the 48 PBCore elements has become a more structured "hierarchical" model of 53 elements, arranged in 15 containers and 3 sub-containers, all organized under 4 content classes. The underlying meaning and attributes of the PBCore elements are not changing. However, their interdependencies and structural arrangements are, along with some modifications to data entry options (see PBCore v1.1 Changes for more information). As many of you are aware, a metadata dictionary used to describe the intellectual content, rights, and formats of public broadcasting media has been developed and made available for your use. 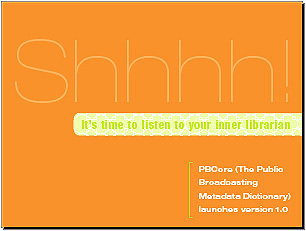 It is called PBCore, or Public Broadcasting Core of Metadata Descriptions (http://www.pbcore.org). PBCore is being used in public radio and television and beyond to describe, publish and share content, and to allow others to find your content. Sounds like a great idea, right? But what, exactly, is a metadata dictionary? For that matter, um... what IS PBCore? Learn the answers to these and other questions at a one-hour on-line presentation hosted by the PBCore Project at WGBH. If you would like to participate in these training presentations, online and live, please go to http://pbcore.webex.com, click on the "Upcoming" tab and register for the session you want to attend. Note that you will be prompted to install the WebEx Java applet once you have completed the registration form. You may install the applet at any time prior to the session. Please contact Geoff Freed at geoff_freed@wgbh.org if you have questions about registration or the presentation itself. "Introduction to PBCore" is the first presentation in a series being developed by the PBCore Project. Upcoming sessions will focus on how to describe a media item using PBCore metadata descriptors and the resources being developed to support your use of PBCore, including the PBCore XML schema and the implementation of PBCore through cataloging tools (for more information see our page about PBCore Training). With the publication of version 1.1 of PBCore, our online User Guide has been re-edited and updated. A Cheat Sheet for PBCore v1.1 is now published. It is a single web page with the PBCore elements organized according to their Content Classes (Intellectual Content, Intellectual Property, Instantiation, & Extensions). The Cheat Sheet includes an alphabetical index at the top of the page, with interactive jumps to a particular element's description. A PDF of the Cheat Sheet for PBCore v1.1 has been generated. This document includes the "bookmark" functionality of PDFs to facilitate moving around the 38 pages. Additionally, the PDF's alphabetical index harvested from the online version of the Cheat Sheet offers the same interactive jumps to particular element descriptions within the PDF document. A link is provided at the top of the Cheat Sheet in order to download the PDF. Discover how others are using PBCore. Share information about metadata extensions. Learn more about the use of the XML Schema for PBCore. Find out how the industry is merging PBCore into their asset management and asset sharing systems. And...keep up on the latest announcements about PBCore. PBCore was the subject of three presentations during the PBS Technology Conference (April 14-16) and the National Association of Broadcasters Conference (April 18-21). Links are provided below to read or view PDF and QuickTime (slideshow) movie versions of the presentations. The presentations are also posted in the Resources section of our website. Building a Community of Practice– A metadata dictionary and the situations in which it is applied are not static. Much work has been accomplished in order to define a core set of metadata descriptors for use by Public Broadcasters and their associated communities and partners. However, we are part of an evolutionary process that is building a "Community of Practice" for the uses and applications of the PBCore. Kentucky Educational Television was part of the PBCore Test Implementation Phase and became an early adopter of our metadata dictionary. KET has embarked on a project to preserve and digitize its archives of video documenting Kentucky's history in order to ensure that this treasure trove of cultural, historical, biographical, educational and public affairs programming is available for years to come. Read the press release with the link below. An upcoming article is to be published by TV Technology. "Shhh...It's Time to Listen to your Inner Librarian"
Here's the last version of our flyer, "Shhhh...It's time to listen to your inner librarian." It announces the impending launch of the PBCore Metadata Dictionary, version 1.0.